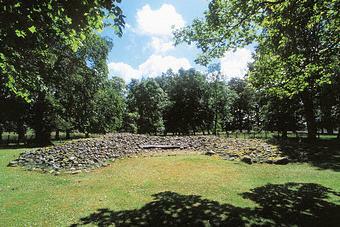 This cairn, a low mound of water-worn boulders much plundered for stone in the past, is still about 20m in diameter. A limekiln was also driven into its west side. There is no chamber, but three cists. The central one (its massive cover slab seen in the photo) is possibly the earliest. Its side-slabs were grooved at one end to give the end-slab a tighter fit. To the south of it there are two other cists. In the southernmost one, one of the end-slabs is decorated with seven pecked axeheads. Another carving of a boat or a beribonned halberd was destroyed in a fire, but a cast is preserved in the Royal Museum of Scotland, in Edinburgh. The site was excavated in 1870, 1929 and 1936: only some cremated bones were found.